Is there any home more quintessentially summery than a lake house? I don’t think so, and that’s why I thought I’d give you a tour of my Mom’s Lake House all decorated for summertime! 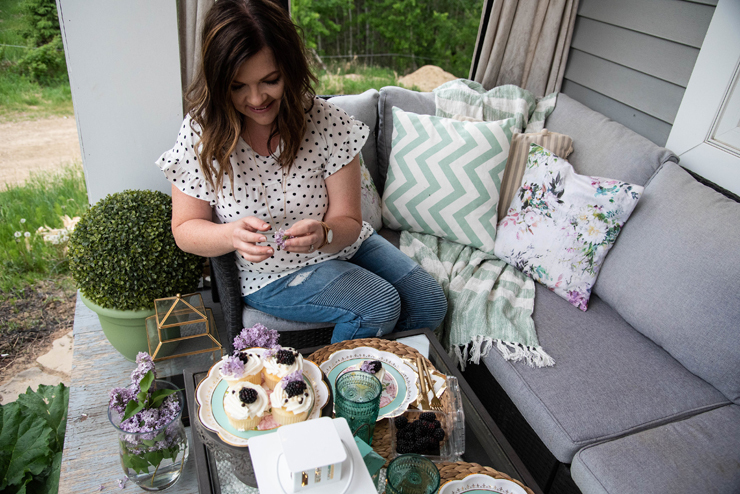 I think you’ll love their beautiful new home just as much as I do, and I hope you’ll find lots of inspiration here on how to decorate your own house for the summer season. 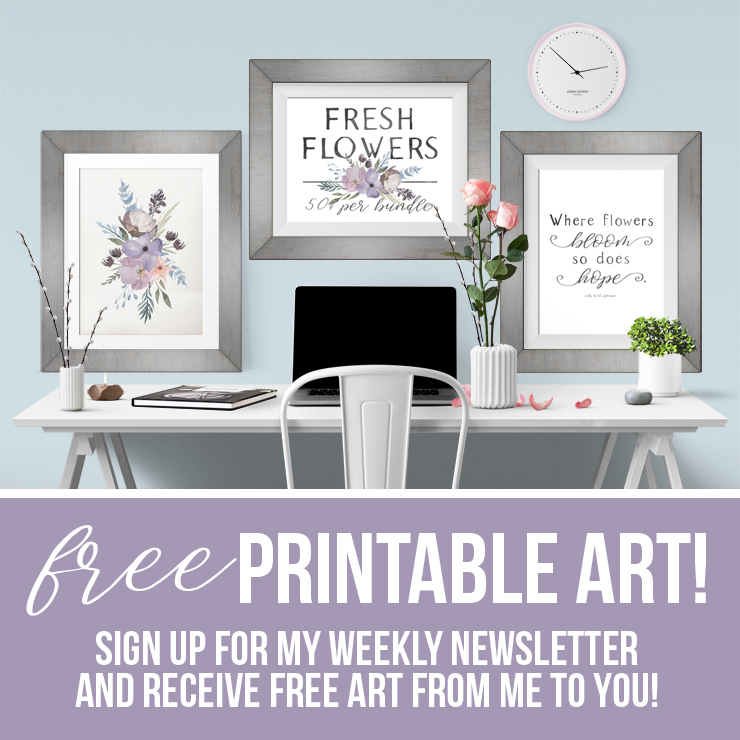 I’m so excited that the Seasonal Simplicity series is back again; and this time it’s to celebrate Summer! 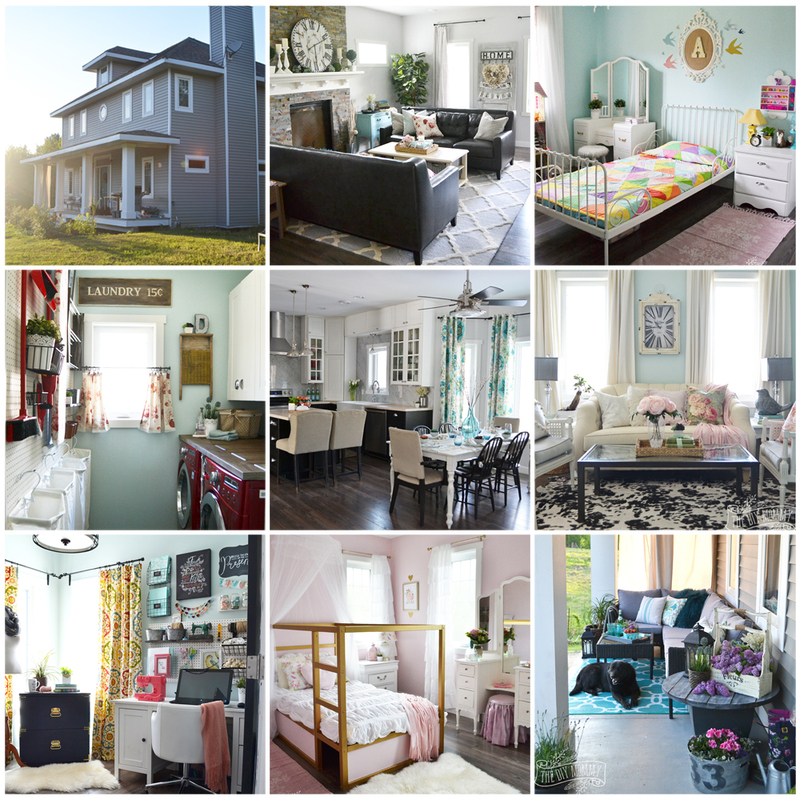 Today I’ve joined up with a talented group of bloggers to share our summer home tours. 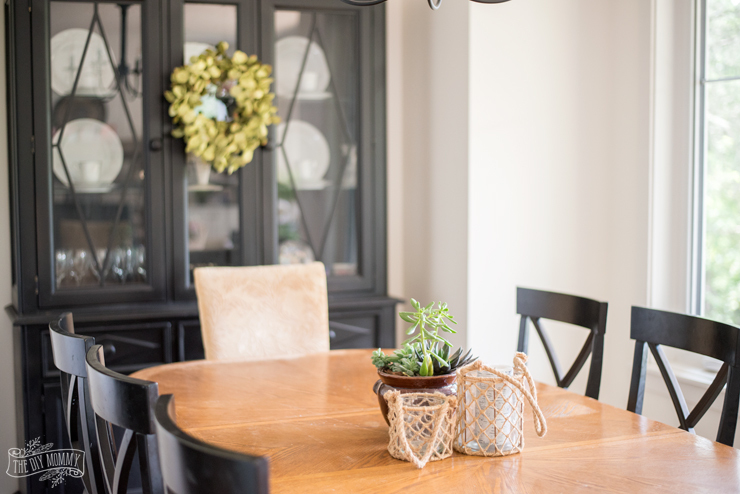 After you’ve read my post, make sure to hop over to all of the other summer home tours linked at the bottom! In case you’re new here – welcome! 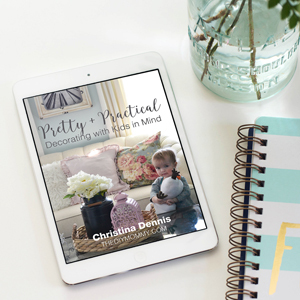 My name is Christina and I blog about all sorts of budget friendly DIY and decor ideas. You can also find me on YouTube right here. 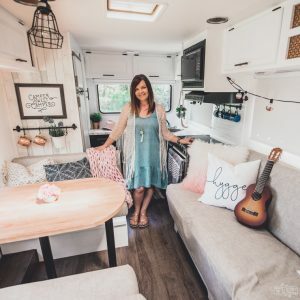 I’ll be sharing more of my own home decorated for summer this month, but today I really wanted to share with you my parents’ new lake house summer tour. You can read more about their building process right here. Let’s go! Let’s start with this lovely living room that my parents have just recently finished. 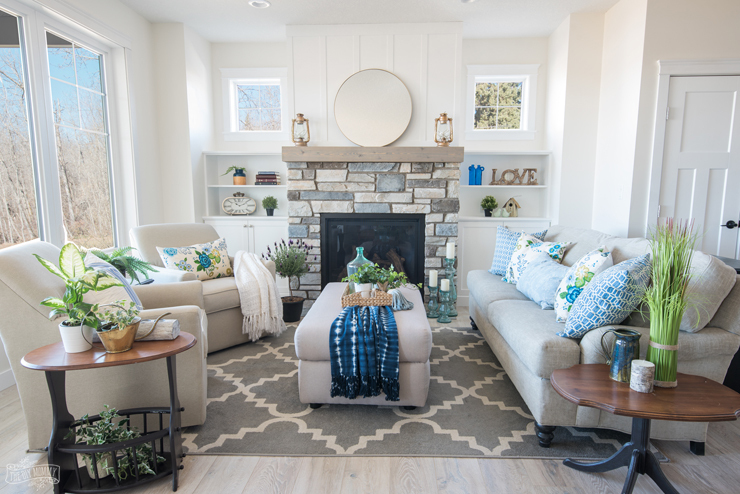 It features a stunning custom fireplace, a couch that my parents built, and this fabulous set of custom swivel chairs – the Designed2B Fabric Accent Swivel Chairs from The Brick. 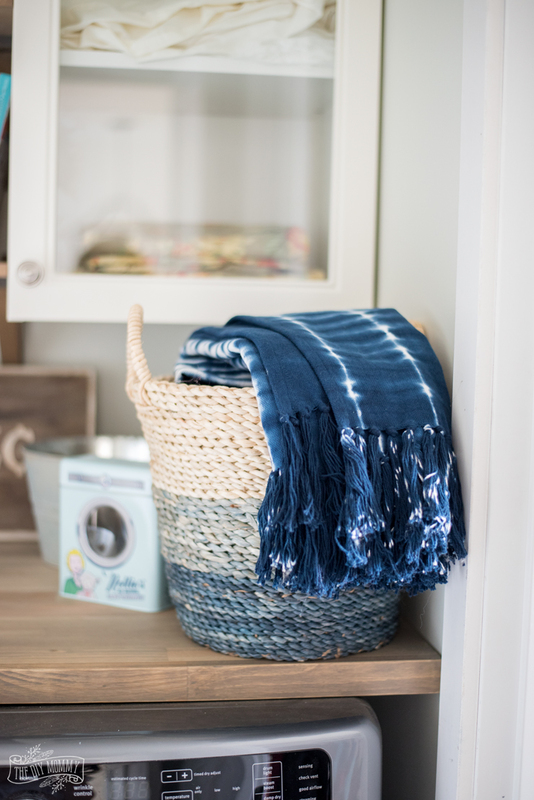 We’ve decorated the living room with lots of blue & green handmade pillows, tons of greenery, and some simple coastal accessories like lanterns, jugs and vases. 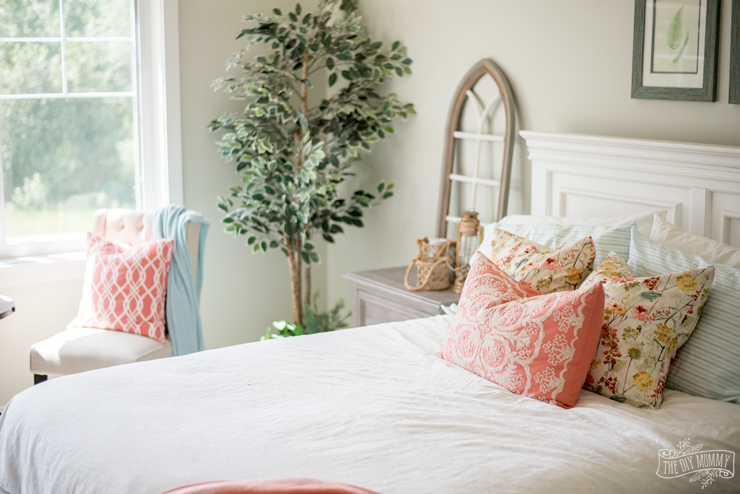 You can see more photos of this room and get more details right here. Then, do a little spin and you’re in Mom & Dad’s kitchen and dining area! 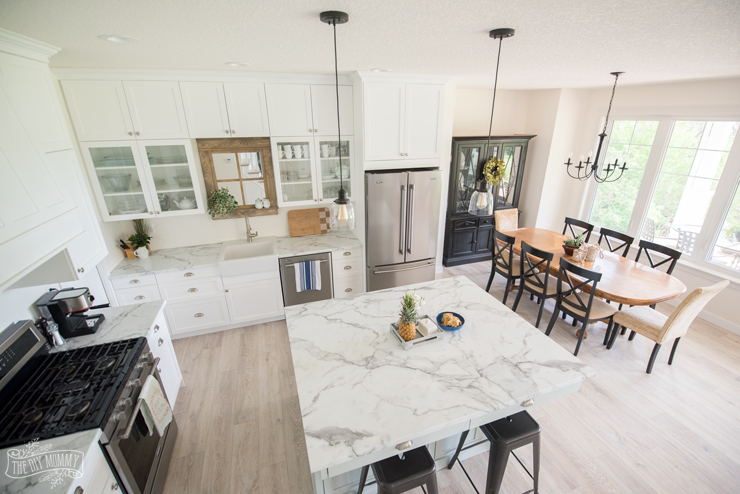 They built the kitchen themselves, and the beautiful Maytag appliances are from The Brick. My parents are still head over heels with the appliances, especially the gas range which can cook breakfasts and even breads to perfection. 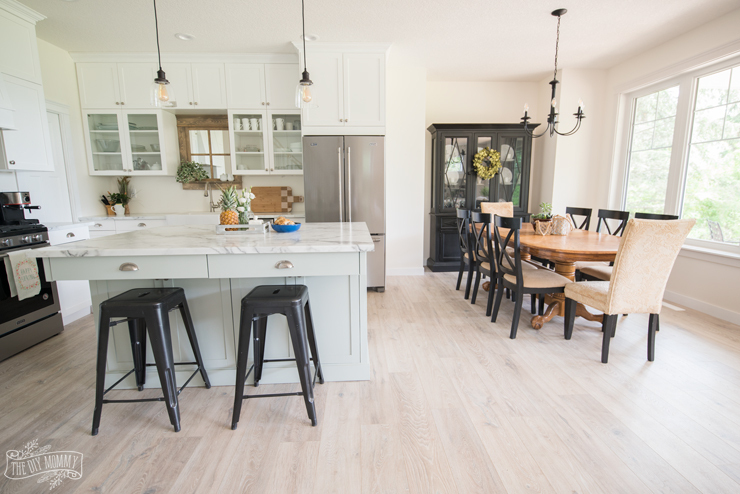 Tones of white and soft grey-green in this space are contrasted with the farmhouse chic black Pinnadel Stools and light fixtures. My mom’s using a vintage table & hutch in the dining area and later she wants to paint the chairs, table base and hutch an off-white to lighten the area up a little. 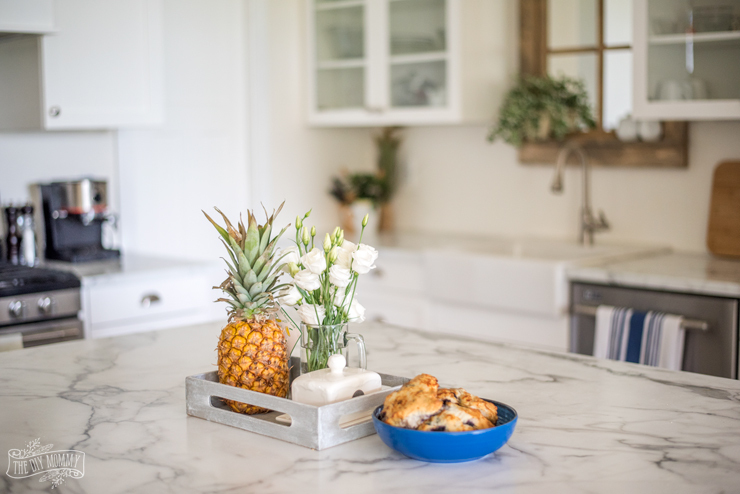 Simple plants, fruit and dishes as soft & summery accents make this kitchen feel light and fresh. Now, let’s head upstairs to the master bedroom! 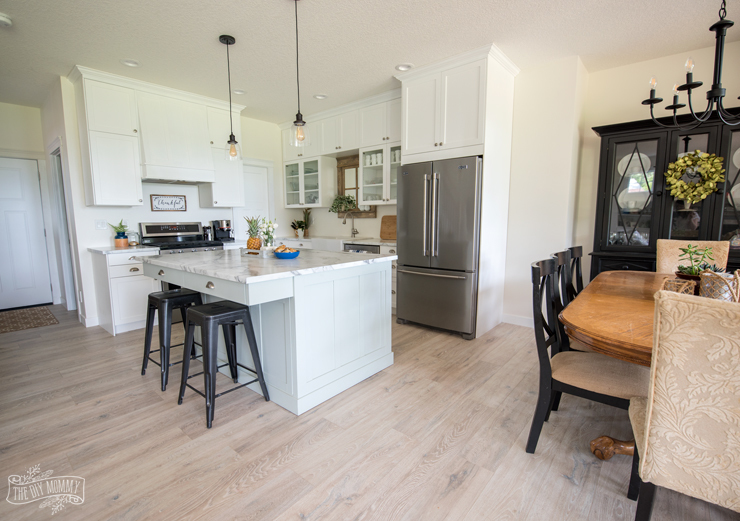 We finished this space for the One Room Challenge last Fall. Doesn’t it look so much more beautiful in the summertime with the green leaves and lake view?! 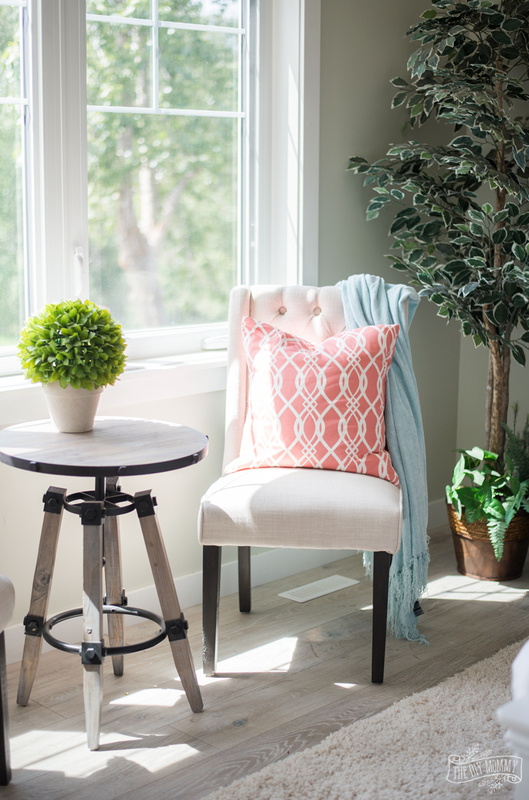 It really highlights the slightly green walls, and I added some pops of coral colour as an accent to make it feel fresh for summer. 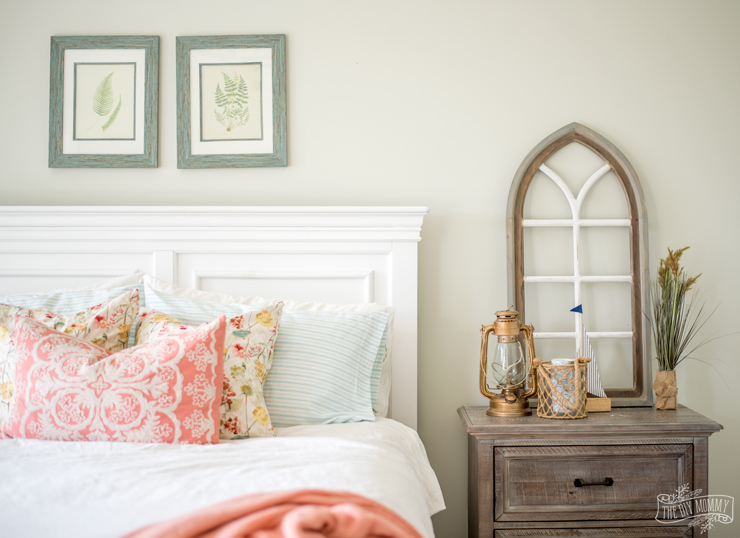 My parents still love their Bridgeport Bed from The Brick, and I enjoy how fun it is to accessorize seasonally – it’s such a classic frame and white is always in style! The Dovetail Grey Calistoga Nighstands are the perfect beach driftwood colour for summer, and I dressed them with some coastal accessories. I love how solid these pieces are and how well they contrast to the bed. 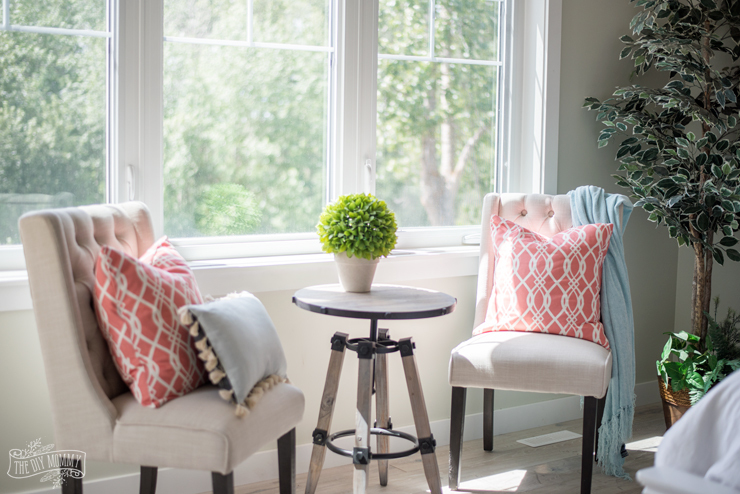 A coral coloured pillow and aqua throw blanket add some summery charm to the sitting area by the big window. The pillows are DIY (you can find my pillow cover tutorial right here), and most of the accessories in this space were found in store at The Brick including this perfectly nautical-industrial accent table. 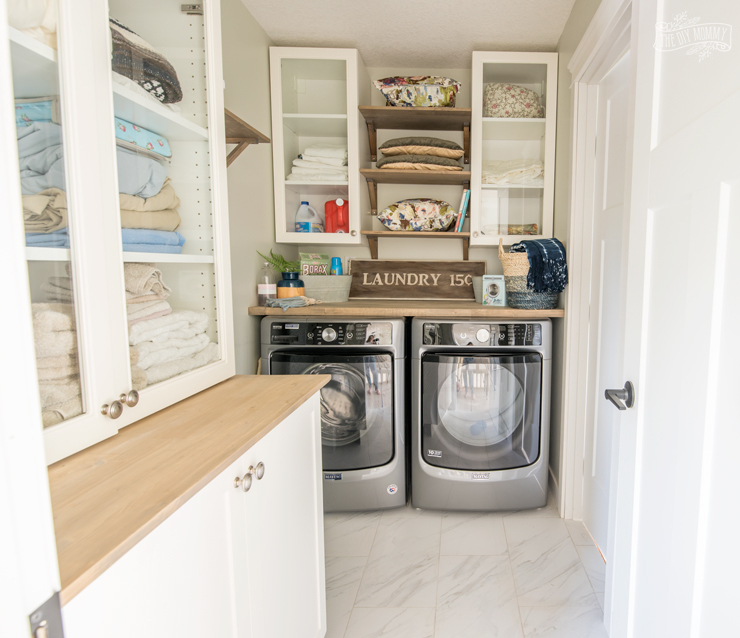 Finally, I want to show you the last completely finished space in Mom’s Lake House that’s ready for summer: the laundry room. 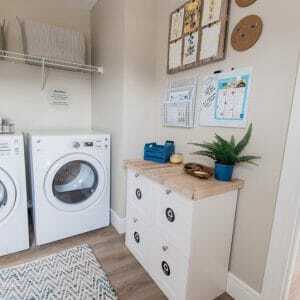 I love this little room – it’s so practical but simply adorable! My parents finished it in January (read more about that process here), and it still looks fabulous. My parents are really loving the Maytag 5.2 Cu. Ft. Front-Load Washer and Maytag 7.4 Cu. 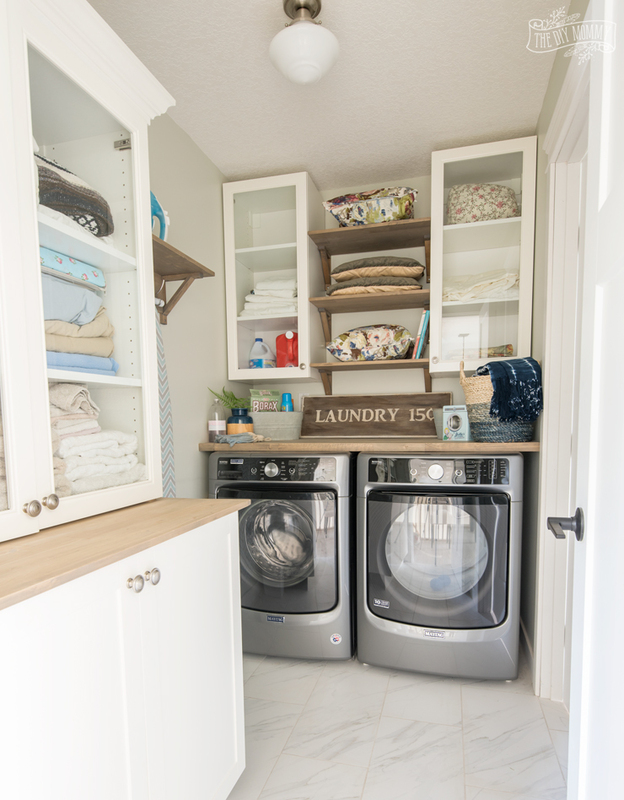 Ft. Electric Dryer from The Brick – not only are they heavy duty, but they do a fabulous job of getting their clothes clean and dry quickly! 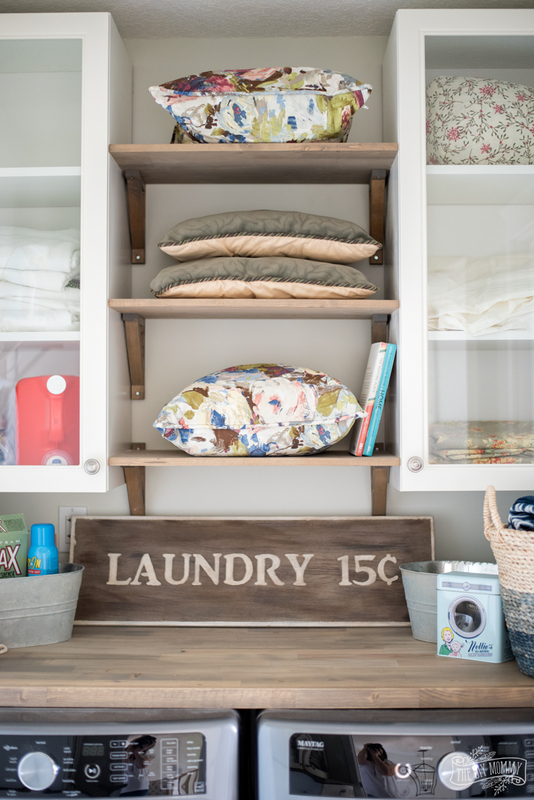 Simple summer accents in this space like a dip dyed indigo basket and navy and floral textiles give this little laundry room a lighthearted feeling for summer. And that’s my parents’ beautiful lake house all decorated for the summer months! I just love how it looks and feels and can’t wait to enjoy it with my family this season. Tell me: Which is your favourite room so far in Mom’s Lake House? Now, make sure you check out all of the other summer home tours happening this week by following the links below! Beautiful lake home, Christina! I’m sure your parents (and the whole family) and thrilled and can’t wait to use it this summer!! Thanks for sharing it and being part of this tour series! It’s a beautiful lake house, Christina! Your parents must be thrilled! Beautiful lake house, Christina! I love all the summer touches. There’s nothing I don’t love about this lake house. I have a question on the kitchen sink area and would really appreciate if you could get back to me on this. I’m also in the middle of a refurbishment project and in a similar situation with the kitchen. 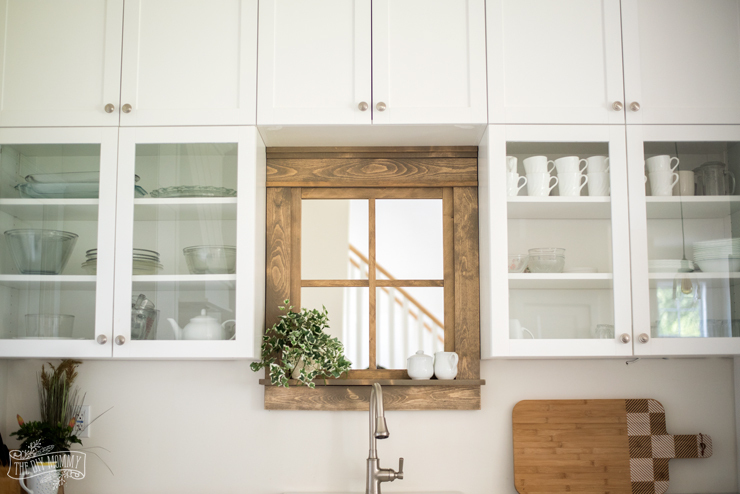 I notice that your kitchen sink has a window adjacent to it; but it appears ‘fake’. It doesn’t open to the outdoors, is that correct? Or am I seeing a reflection on the windows? I’m in a bit of a dilemma on a similar matter these days. Do I place the sink in the best spot aesthetically, which is not facing the outside. Or do I keep it in the 2nd best place, which will open it to the outside. Thanks for stopping by and the kind words. You’re correct that is not a really window but an decorative accent piece. Every inch is just simply stunning! A lake house tops the list. Great pictures, thank you.